"I was more alive at that time than before or since." The Last of the Blonde Bombshells stars Judi Dench as Elizabeth, a recently-widowed woman who spent her World War II years playing mean saxophone as a member of The Blonde Bombshells. After she encounters an old friend, Patrick (Ian Holm), who played for a time with the Bombshells in drag to avoid his National Service obligations, she shares her memories with her granddaughter, Joanna (Millie Findlay). Joanna encourages her to reunite the old band, and the hunt for the rest of the group begins. To its credit, the film recognizes its aging protagonists as such and doesn't force them into stereotypical AARP-approved personalities—Elizabeth is allowed to be cantankerous, Patrick cheap and lecherous, and the other Bombshells infirm, inhibited, bored, mentally ill, even dead. These are heroic characters whose heroism is long behind them, left in bomb-threatened dance halls and dusty photographs; they were never honored with medals, but simply did their duty to keep public morale up in a London under siege. Director Gillies MacKinnon treats the material with a light hand, keeping the pacing gentle and the stakes low—the big reunion gig is merely Joanna's elementary-school dance, which keeps the focus on the characters. The cast is uniformly excellent—Ian Holm is casually charming in a rapscallion role, and young Millie Findlay plays her character's intelligence without a hint of affectation. Cleo Laine gets to belt out a tune, Olympia Dukakis has fun as a wealthy eccentric, and Leslie Caron still looks great in a small role. But this is Judi Dench's show all the way, as Elizabeth rediscovers herself and her past, finding personal validation and a joy that overcomes but does not replace her pain. She's funny, emotional and lots of fun to watch here, and her performance carries the movie. It must be said that there's not much here beyond the gently sparkling performances—the story is relatively predictable, providing just enough action to hang the characterizations on, and it ultimately trails off into thin air. The film has many nice moments, but it's light, ephemeral stuff that isn't likely to stand up to repeat viewing. Still, there are worse ways to spend 84 minutes than by enjoying some fine World War II-vintage music and memories with The Last of the Blonde Bombshells. Image Transfer Review: HBO presents The Last of the Blonde Bombshells in its original made-for-HDTV 1.78:1 aspect ratio, billed as 16:9 on the snapper case. The downconverted anamorphic transfer generally looks just great on DVD, with solid blacks, excellent shadow detail and stable details; if it weren't for some obnoxiously noisy reds, this would be an "A" transfer. As it is, it's still pretty impressive. Audio Transfer Review: The Last of the Blonde Bombshells features English and Spanish Dolby Digital 2.0 audio; the English track is billed as Dolby Surround, with the Spanish track listed only as Stereo. I didn't notice a great deal of difference between the two; both feature crisp musical renditions of World War II-era tunes with decent low-end bass, and the only significant soundstage imaging is across the front. Dialogue is generally centered, and scenes recorded "live" occasionally pick up significant background noise. Perfectly appropriate audio for this pleasant little comedy, nicely mastered for DVD. Extras Review: This is a fairly bare-bones disc, with 13 picture-menu chapter stops, subtitles in three languages, and Cast/Crew notes for eight actors, director and screenwriter. The well-written biographies are illustrated with images from the film, and selected filmographical information is sometimes listed bullet-style, at other times integrated with the bio text. 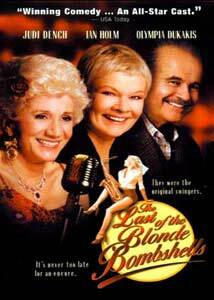 The Last of the Blonde Bombshells is an affectionate, lightweight comedy about rediscovering one's purpose, given a sharp (but relatively bare-bones) DVD transfer by HBO. A pleasant little rental.